Question: After reading your last post I did some research on film photography. I recently acquired an old Olympus OM-1 from my grandfather and wanted to try shooting some real film photos. From what I read, film can suffer from something called reciprocity failure if you take too long an exposure, but I couldn’t understand the explanation. A lot of it had to do with chemistry. Could you provide a simple explanation? — H.E. III, Fremont, Nebraska. Answer: I can do better than just explain it. The photo above, taken around 1985, shows reciprocity failure in spades. The film was Ektachrome 1600, and my camera a Pentax K2 with its stock Zeiss 28–135 mm lens at ƒ/2.8. I didn’t bother recording the exposure settings because I knew they were too long … maybe 10 seconds or thereabouts. But I was bracketing and trying for the best shot of a fairly faint object: the Andromeda Galaxy aka M31. The reciprocity failure manifests as the greenish tint over most of the image, and the “washed out” mostly white stars. Reciprocity (when it doesn’t fail) is the simple reciprocal relationship between exposure time and brightness — the brighter the object the shorter the exposure time. An object’s brightness has two components: intrinsic brightness and aperture setting, together which determine how much light gets to the film. For half as much brightness, using twice the exposure time should compensate. 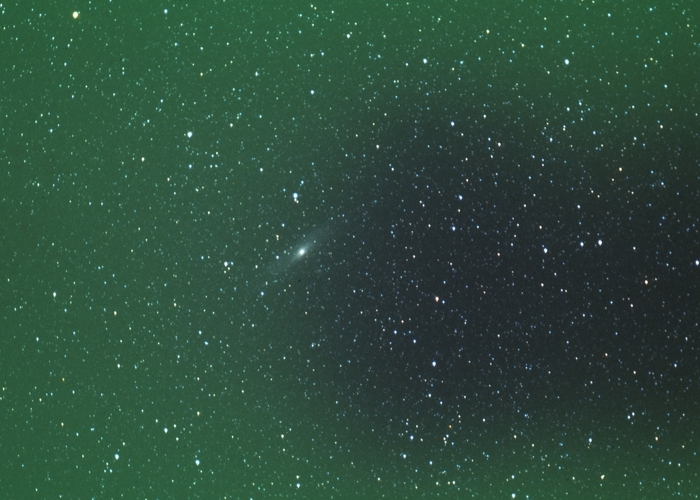 So for very faint objects like M31 a very long exposure time should compensate. And it does — up to a point. The mathematical relationship breaks down at very long exposures because of the chemistry of film emulsions. Without getting into any chemistry formulae, suffice it to say that the chemical grains responsible for reacting to the colors red, green, and blue have differing light sensitivities. In the case of 35 mm slide film, which I used for that photo, the shift was almost always toward the green. There’s a similar effect with modern digital imaging sensors when working at very low light levels, but the cause is different. With digital photography, something called the dark current introduces noise into the image. 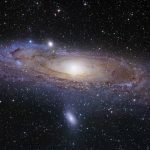 You can get around some of it by actively cooling the sensor chip with fans or electric heat pumps, but now you’re getting into the high end of “amateur” astronomy. You won’t need to worry about reciprocity failure for most common terrestrial photos. Reciprocity will apply just fine and you can use the simple rule that “1 full stop = 50% change in brightness” with the term “1 full stop” applying to shutter speed, aperture, and ISO. Playing around with those combinations at any given light level is where the creative aspect of photography emerges, as when freezing or intentionally blurring motion. Personal computers were still new in 1985, and digital photography was a decade in the future. 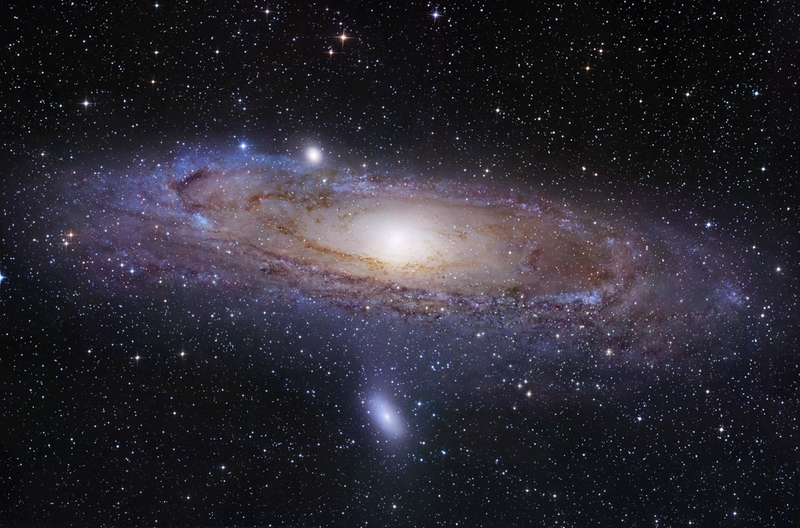 But just for kicks I tried using some modern image processing software to “repair” my old Andromeda photo. First thing I did was convert it to grayscale. Then, using masks, I selectively improved the contrast where the green had been. Finally, I used a sharpening filter to remove the “fuzz” around larger stars. 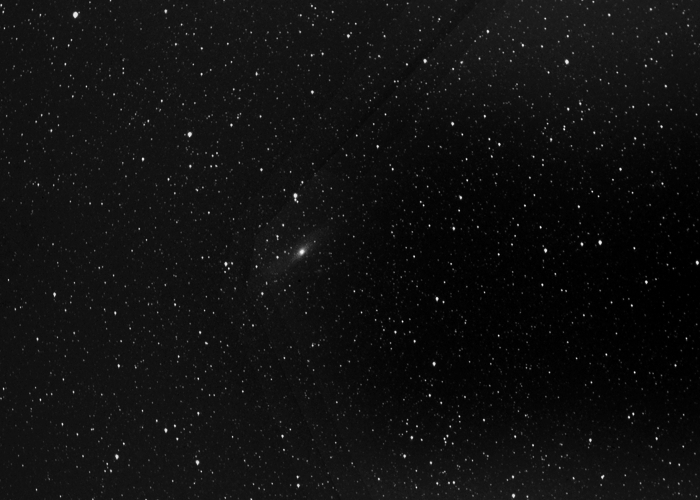 You can just barely make out M31’s two largest satellite galaxies (if you know where to look).